My nephew took this picture of us as we went through the Halstead Parade last Saturday. It was a beautiful morning for a parade. After the parade we went to the park to look at the cars in the car show. We parked across the street from the park. Even though we were not in the car show, several people came over to look at the jeep. When we saw people looking at it, we went over to talk to them. 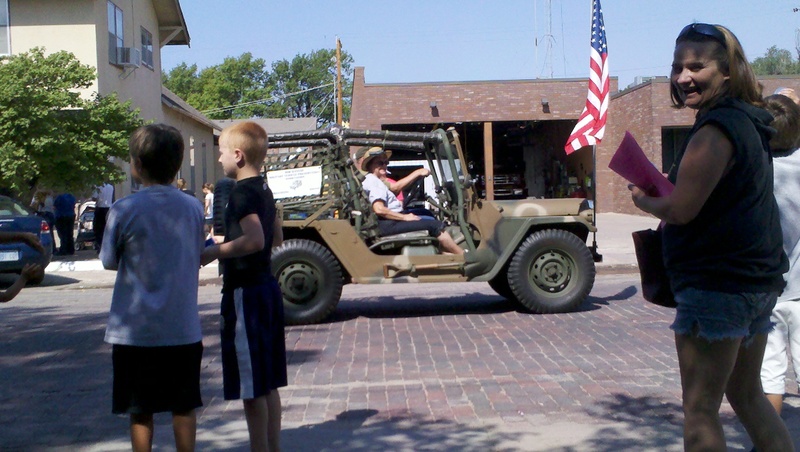 Here’s a couple of pictures from the parade in Harper I attended yesterday. I had a jeep full of grandkids and great-nieces and nephews. Halstead Old Settlers Parade this Saturday at 10:00 a.m. Registration starts at 8:00 a.m., but if we are there by 9:00 a.m. that will be fine. The parade starts at 10:00. The high school is located at 520 W. 6th. Registration is at the east end of the high school parking lot. No meeting this Saturday the 13th. There will be no meeting this Saturday the 13th because of everyone coming in for the ice cream social last Sunday. Events coming up are the Apple Days in Ft. Riley, September 24th at 9 a.m. Which, Kendall and boys, Loren and Lowell are going to attend. Let me know if any others want to join them. Petit Jean Rally in Arkansas is September 23rd and 24th. We will have our next meeting September 10th unless otherwise noted. Maybe it will be cooler! We sure had a great time. It was hot but we took comfort of the air conditioning inside. We want to thank Jason and Ron for standing out at the bomb grill cooking hamburgers. They were ready for a cold drink. We had hamburgers, thanks to the Deckers, spaghetti salad, deviled eggs, relish tray, great sauce and chips, watermelon, chocolate cake, brownies, and three kinds of ice cream. Thanks to all, for food and fun. We had 20 members and family; Kendall, Janice, Ashton, Weston, Richard, Diane, Marilyn, Ron, Judy, Gary, Jim, Stephanie, Larry, Sharon, Jason, Cooper, Katelynn, Kristina, Logan, and Loren.